Summary: Steve Rogers struggles to embrace his role in the modern world and teams up with Natasha Romanoff, aka Black Widow, to battle a powerful yet shadowy enemy in present-day Washington, D.C. 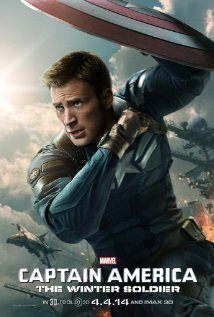 There was a time when the original Captain America film was the weak link in the Marvel film franchise. Then came along Iron Man 3 which seemed to disappoint a lot of critics and fans alike… there were also a few (present writing company not included) that was disappointed in Thor 2 as well. So really there was a fair bit of pressure on Marvel with Captain America: The Winter Soldier, would the franchise just keep going downhill after the mountain peak that was The Avengers. To be honest what scared me the most about going into Captain America: The Winter Soldier was who was directing it. Now I have nothing personal against Anthony and Joe Russo, in fact I admire the fact they are part of the team behind one of my favourite television shows of all time – Community, what I was more worried about was the fact that they are largely comedy directors and it didn’t seem right that the men behind You, Me And Dupree were now in charge of a big blockbuster action franchise film. Well, I’m here to admit that I was wrong, because aside from putting this franchise back on track Captain America: The Winter Soldier also reveals The Russos as a hidden talent in the action directing stakes. The film opens with a seemingly adjusted Steve Rogers/Captain America (Chris Evans) who now outwardly seems to have settled into his new role as a full-time agent of S.H.I.E.L.D. However we soon learn, that on the inside his feelings are completely different. Aside from trying to come to terms with the modern generation he is also trying to get his emotions and feelings in check after ‘thawing out’ and is having some serious trust issues with his boss Nick Fury (Samuel L. Jackson). This comes to the forefront after a mission in which he learns his good friend Natasha Romanoff/Black Widow (Scarlett Johansson) had different commands from Fury to which he had been told about and the end result is the two of them narrowly escaping with their lives. Steve’s trust in S.H.I.E.L.D. is at an all time low when a raid on the organisation, seemingly led by the mysterious Winter Soldier (Sebastian Stan) leaves the entire team in danger and not trusting each other. With S.H.I.E.L.D. very much divided it is up to Captain America, Black Widow and Steve’s newfound friend Sam Wilson/The Falcon (Anthony Mackie) to try and piece together exactly what has happened while they try to save the world that is now treating them as fugitives. It really does feel that the team behind Captain America: The Winter Soldier have gone for the whole ‘bigger is better’ philosophy when putting together the film. Some may question the fact that many of the smart quips that worked in the previous films seem to be missing this time around but instead The Russos have completely revamped the series with a series of big action blockbuster sequences that certainly wouldn’t have looked out of place during any of J.J. Abrams’ Star Trek movies. Surprisingly, due to their lack of action film experience, The Russos pull these scenes off remarkably well and the sight of giant flying battleships crashing into buildings isn’t going to be something that fans of the franchise are going to forget for a long time to come. In fact in some ways it is strange the script works at all. The screenwriting team seem to pay very little regard to things such as characterisation, something that most screenwriters would have thought to be a must with the introduction of The Falcon, yet somehow as an audience you never ever really feel that it lets down the film. On the other hand though they have really upped the action and in a rarity for Marvel films there is also quite a bit of gunplay this time around. I won’t give way much but Captain America’s shield seems to be deflecting a hell of a lot of bullets this time around while Aussie actor Callan Mulvey has the dubious honor of actually holding a gun to the head of Captain America. To pay credit to the screenwriters they also bring in some other surprises as well. The fact they dwell on Steve’s mistrust of S.H.I.E.L.D. brings a great feel of suspense to the film, while it is easy to see that one of the other storylines that surfaces during the film seems to take direct aim at Governments who believe that they have the power to be Big Brother to whomever they feel as well. Perhaps the biggest surprise of all is though that even while the script works feverishly to try and introduce a romantic interest for Steve it also seems to inadvertently bring in some sexual tension between himself and Natasha, whether it was deliberate or just seemed to flow from some natural chemistry between Johansson and Evans it was certainly there for all to see. The fact that the script didn’t go to deep of course meant that there isn’t really any scenes that are going to stretch the acting capability of the cast. Evans as usual plays the sullen Captain America well; some call him bland although I prefer to think that he has grown into the role well. Scarlett Johansson once again brings a true sexual feel to one of the toughest female characters to ever grace the screen in Black Widow while Anthony Mackie is likable as The Falcon. Mackie’s inclusion must also have fans of the franchise chapping at the bit to see what kind of quips can be created when he has to share scenes with Robert Downey Jnr. The old brigade of Samuel L. Jackson and Robert Redford also bring a sense of style and respectability to the cast. Redford is playing a very against type character while Jackson seems to relish that this time around the screenwriters have brought a more ‘human’ feel to Nick Fury. Australian film lovers will also wear a smile when acting great Alan Dale appears on the screen as well, it’s not a massive role but he is there. Captain America: The Winter Soldier certainly puts the ‘BIG’ back into big action blockbuster. Its out-of-this-world special effects and great action sequences plus this franchise back at the heights it deserves to be at. Other Subculture Media Reviews of ‘Captain America: The Winter Soldier′: Nil.